Free to Be Me: Surprised Myself! It's a roof rat and I woke up to one in the early morning hours last Thursday. Waking up to a roof rat in your bedroom that is so big it is scratching at the door to get out like a cat is not a way I recommend! Fortunately I had the presence of mind to turn on the light before I put my feet down on the floor and I saw it turn and run into the bathroom! I crept out of bed and over to the bathroom door which I quickly slammed shut and put a pillow in front of. I am not quite sure what I thought the pillow would do, but it made me feel better! I then called Tim, who had already left for Bible study, and shrieked into the phone that there was a rat in the bathroom. We knew we had rats. We just thought they were contained in the basement. Silly us! Being quite a few miles from home, Tim called our friend, Dustin, who was meeting with our other friend, Ronnie. Not too many minutes later, Dustin and Ronnie showed up at the door at 6am, hockey sticks perched on their shoulders! I'd like to say they came in, found the rat, killed it and left...all before my first cup of coffee! (A girl should not have to deal with stuff like this before a morning cup of coffee!) That was not how the story was to unfold, though. They did manage to get the rat out of my closet (*insert frantic face at the thought of a rat amongst my clothes*) and closed off the closet and toilet area. They put a trap in the bathroom and Dustin promised he'd be back later if the rat was still around. Seeing my knights with shining hockey sticks leave was not a good feeling! I did what any smart-thinking girl who has a rat in her bathroom would do, though...I duct-taped the bottom of the bathroom door to eliminate any possibility of it slipping out. And thus began a very long day of listening to rat sounds on the other side of the wall! Shortly after Tim got home, Dustin arrived with several shotguns slung around his neck! 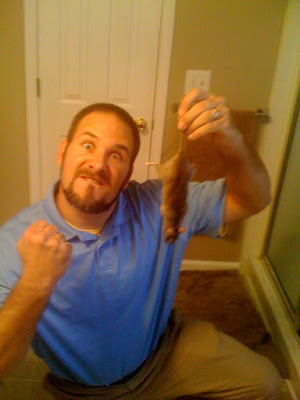 Just playing, of course, he declared he was really going to use his "fist" to kill the rat! Fist? Are you kidding me? Makes me shiver to think of it again! So Dustin-the-Brave and Tim-the-not-so-Brave (he helped from the safety of the bathtub ;O) ) entered the bathroom with a mission on their mind. At various points it sounded like ultimate fighting was taking place in the bathroom. There was shouting and banging and the rattling of coat hangers designed to fish the rat out from its hiding place under the cabinet. Eventually it did, in deed, emerge from its hiding place and attempted to launch itself into the tub. (Wish I could have seen Tim's face then!) A chase ensued and the rat was pinned in the corner! At long last there was a shout and a very vocal declaration of victory coupled with much jumping up and down! Dustin emerged from the bathroom to pronounce the rat had met an untimely demise at the bottom of his fist! Yes, true to his word, Dustin had punched the rat to death! I still am not exactly sure why he chose that means of eliminating the rat, but I must say it was rather effective. Wanna see? Now the whole purpose of this post was really to talk about the dilemma I now find myself in! One of the guys at Bible study told Tim he was surprised I was freaking out so much because he thought I was tough! I must admit I have to agree with him. I surprised myself, too, with the depth of my panic and fear upon finding this rat in my room! While I am thankful this rat and the 4 others we have trapped in the basement are gone, I feel like I may need therapy to get over this one! *insert face twisted in shame* I truly have been traumatized by this experience and have continued to feel the effects. As someone who has always walked around the house in the dark at night, I now find myself with a flashlight on my bedside table. I am accutely aware of every sound going on around me and I may never again, at least until the memory is not so firmly ingrained in my mind's eye, simply get out of bed without counting the potential cost. So I am here to declare...I am not as tough as we all thought. I can birth a huge baby standing up in my bathroom, but I have a very real and somewhat irrational fear of rats! Oh, eww. I can say I've beaten a wood rat to death in my backyard with a shovel, but I don't know about IN MY BEDROOM. Eek! Shivering with you and praying for the memory to fade soon. OH my!!! I would have shrieked as well. You have crossed into a new level of womanhood. Whitney and Shaka eat your hearts out. For us northerners we put these type of kills over the mantle. You guys down south may want to get rat tags for this guy.This is just plain nasty. uuugghhhh! And I mean a big ol' Charlie Brown UUUGGHHHH!!!!!!!!!! While I was reading this, our poor little dog walked between my calves and I almost launched myself to the moon. SHUDDER!!! I'll take childbirth over finding that IN MY BEDROOM!! I will cherish the thoughts of those guys with hockey sticks for a looong time! LOL Barb, I believe God was merely strengthening you & I believe He got your attention!Thanks for sharing. I believe we ALL have weaknesses,but when the rubber meets the road,God has already equipped us for the storms we encounter.We just need to grab ourselves up by the bootstraps & trust God! Did I mention my fear is SNAKES?